Texas Trust Credit Union generates $110,000 for local schools through member participation in Spirit Debit Rewards program. 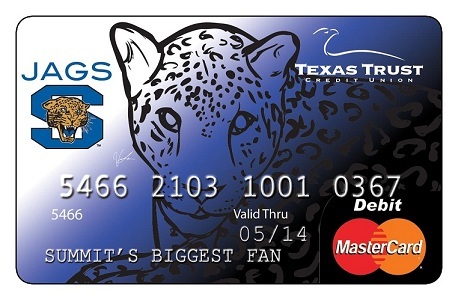 This debit card shows support for the Mansfield Summit High School Jaguars. A rewards program which allows cardholders to direct funds to local schools and school districts has proven to be driving force for both the credit union and the recipient schools.